The ClickXact system has been successfully used to map and measure surface cracks as part of Plant Condition Monitoring. 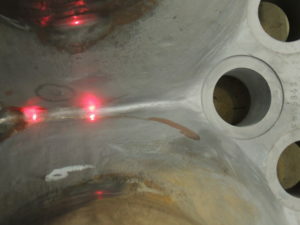 The system is used to take photographs of the component that need to be assessed with the laser device. This is especially useful when the component need to be assessed without being removed from its installation. The Picture is drawn into custom software where all the measurements are performed. Each of the surface cracks are measured in terms of length and width of the crack, and is mapped to a fixed point on the component. A documented report is then stored for future reference in order to monitor changes in the surface cracks during the next assessment cycle.